I (bobembry) highly recommend. If you’ve explored management concept books, this provides a completely different viewpoint—inside somebody else’s situation. Just reading the cases will broaden your horizons. The Daily Drucker is also a way to rapidly expand horizons. 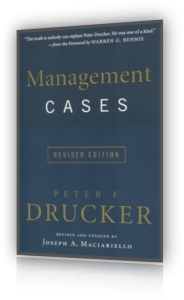 “Management Cases, Revised Edition” is a collection of thought-provoking case studies—each a timeless representative of a challenge that all managers will face at some point in their careers. Longtime Drucker colleague, collaborator, and eminent management professor Joseph A. Maciariello has organized the material to be used in conjunction with Management, Revised Edition, making the book particularly useful in undergraduate, MBA, and executive education classrooms. It contains fifteen completely new cases written especially for this edition plus another thirty-five revised and updated cases, ensuring that the book provides comprehensive coverage of the most important management dilemmas and most timeless leadership wisdom. An essential resource for business students and working professionals alike, the book will help readers test and hone their management skills. What Is a Growth Company? Rural Development Institute: Should It Tackle the Problem of the Landless Poor in India? Should the Water Utility Operate a Museum? What Are “Results” in the Hospital? How Does One Analyze and Organize Knowledge Work? Can One Learn to Manage Subordinates? How to Staff the Dead-end job? Are You One of “Us” or One of “Them”? Can You Manage Your Boss? Who Is the Brightest Hamster in the Laboratory? What Is the Contribution of Bigness? Visitors to the campus were always shown the University Art Museum, of which the large and distinguished university was very proud. A photograph of the handsome neoclassical building that housed the museum had long been used by the university for the cover of its brochures and catalogues. The building, together with a substantial endowment, had been given to the university around 1932 by an alumnus, the son of the university’s first president, who had become very wealthy as an investment banker. He also gave the university his own small, but high quality, collections—one of Etruscan figurines and one, unique in America, of English Pre-Raphaelite paintings. He then served as the museum’s unpaid director until his death. During his tenure he brought a few additional collections to the museum, largely from other alumni of the university. Only rarely did the museum purchase anything. As a result, the museum housed several small collections of uneven quality. As long as the founder ran the museum, none of the collections were ever shown to anybody except a few members of the university’s art history faculty, who were admitted as the founder’s private guests. After the founder’s death, in the late 1940s, the university intended to bring in a professional museum director. Indeed, this had been part of the agreement under which the founder had given the museum. A search committee was to be appointed; but in the meantime, a graduate student in art history who had shown interest in the museum and who had spent a good many hours in it took over temporarily. At first, she did not even have a title, let alone a salary. But she stayed on acting as the museum’s director and, over the next thirty years, was promoted, in stages, to that title. But from that first day, whatever her title, she had been in charge. She immediately set about changing the museum altogether. She pursued new gifts, again primarily small collections from alumni and other friends of the university. She organized fund-raising for the museum. But, above all, Miss Kirkhoff began to integrate the museum into the work of the university. When a space problem arose, she offered the third floor of the museum to the art history faculty, which moved its offices there. She remodeled the building to include classrooms and a modern and well-appointed auditorium. She raised funds to build one of the best research-and-reference art-history libraries in the country. She also began to organize a series of special exhibitions built around the museum’s own collections, complemented by loans from outside collections. For each of these exhibitions she had a distinguished member of the university’s art faculty write a catalogue. These catalogues speedily became the leading scholarly texts in the fields. Miss Kirkhoff ran the University Art Museum for almost half a century. But old age ultimately defeated her. At the age of sixty-eight, after suffering a severe stroke, she had to retire. In her letter of resignation she proudly pointed to the museum’s growth and accomplishment under her stewardship. “Our endowment,” she wrote, “now compares favorably with museums several times our size. We never have had to ask the university for any money other than for our share of the university’s insurance policies. Our collections in the areas of our strength, while small, are of first-rate quality and importance. Above all, we are being used by more people than any museum of our size. Our lecture series, in which members of the university’s art history faculty present a major subject to a university audience of students and faculty, attract regularly three to five hundred people; and if we had the seating capacity, we could easily have a larger audience. Our exhibitions are seen and studied by more visitors, most of them members of the university community, than all but the most highly publicized exhibitions in the very big museums ever draw. Above all, the courses and seminars offered in the museum have become one of the most popular and most rapidly growing educational features of the university. Miss Kirkhoff strongly recommended that the university bring in a professional museum director as her successor. “The museum is much too big and much too important to be entrusted to another amateur such as I was forty-five years ago,” she wrote. The university took Miss Kirkhoff’s advice. A search committee was duly appointed, and after one year’s work, it produced a candidate whom everybody approved. The candidate was himself a graduate of the university who had then obtained his PhD in art history and museum work from the university. Both his teaching and administrative record were sound, leading to his present museum directorship in a medium-sized city. There he had converted an old, well-known, but rather sleepy museum into a lively, community-oriented museum whose exhibitions were well publicized and attracted large crowds. The new museum director took over with great fanfare in September 2001. Less than three years later he left—with less fanfare, but still with considerable noise. Whether he resigned or was fired was not quite clear. But that there was bitterness on both sides was only too obvious. When he said these things in an interview with the college newspaper, everybody nodded in approval. It soon became clear that what he meant by “community resource” and what the faculty and students understood by these words were not the same. The museum had always been “open to the public,” but, in practice, it was members of the college community who used the museum and attended its lectures, its exhibitions, and its frequent seminars. The first thing the new director did, however, was to promote visits from the public schools in the area. He soon began to change the exhibition policy. He promoted these exhibitions vigorously in the newspapers, in radio and television interviews and, above all, in the local schools. As a result, what had been a busy but quiet place was soon knee-deep in school children, taken to the museum in special buses that cluttered the access roads around the museum and throughout the campus. The faculty, which was not particularly happy with the resulting noise and confusion, became thoroughly upset when the scholarly old chairman of the art history department was mobbed by fourth graders who sprayed him with their water pistols as he tried to push his way through the main hall to his office. Increasingly, the new director did not design his own shows, but brought in traveling exhibitions from major museums, importing their catalogue, as well, rather than having his own faculty produce one. The students, too, were apparently unenthusiastic after the first six or eight months, during which the new director had been somewhat of a campus hero. Attendance at the classes and seminars held in the art museum fell off sharply, as did attendance at the evening lectures. When the editor of the campus newspaper interviewed students for a story on the museum, he was told again and again that the museum had become too noisy and too “sensational” for students to enjoy the classes and to have a chance to learn. What brought all this to a head was an Islamic art exhibit in late 2003. Since the museum had little Islamic art, nobody criticized the showing of a traveling exhibit, offered on very advantageous terms with generous financial assistance from some of the Arab governments. But then, instead of inviting one of the university’s own faculty members to deliver the customary talk at the opening of the exhibit, the director brought in the cultural attaché of one of the Arab embassies in Washington, DC. The speaker, it was reported, used the occasion to deliver a violent attack on Israel and on the American policy of supporting Israel. A week later, the university senate decided to appoint an advisory committee, drawn mostly from members of the art history faculty, which, in the future, would have to approve all plans for exhibits and lectures. Six months later, in June 2004, his resignation was announced. Under the bylaws of the university, the academic senate appoints a search committee. Normally, this is pure formality. The chairman of the appropriate department submits the department’s nominees, who are approved and appointed, usually without debate. The dean who presided, sensing the tempers in the room, tried to smooth over things by saying, “Clearly, we picked the wrong person the last time. He was immediately interrupted by an economist, known for his populism, who broke in and said, “I admit that the late director was probably not the right personality. But I strongly believe that the personality was not at the root of the problem. He tried to do what needs doing and that got him in trouble with the faculty. He tried to make our museum a community resource, to bring in the community and to make art accessible to broad masses of people, to the African-Americans and the Puerto Ricans, to the kids from the inner-city schools, and to the lay public. And this is what we really resented. Maybe his methods were not the most tactful ones—I admit I could have done without those interviews he gave. But what he tried to do was right — see Practical Thinking. “This is nonsense,” cut in the usually silent and polite senate member from the art history faculty. “It makes absolutely no sense for our museum to try to become the kind of community resource our late director and my distinguished colleague want it to be. First, there is no need. The city has one of the world’s finest and biggest museums and it does exactly that and does it very well. Secondly, we here have neither the artistic resources nor the financial resources to serve the community at large. We can do something different but equally important and equally unique. Ours is the only museum in the country, and perhaps in the world, that is fully integrated with the academic community and truly a teaching institution. We are using it, or at least we used to until the last few unfortunate years, as a major educational resource for all our students. No other museum in the country, and as far as I know in the world, is bringing undergraduates into art the way we do. All of us, in addition to our scholarly and graduate work, teach undergraduate courses for people who are not going to be art majors or art historians. We work with the engineering students and show them what we do in our conservation and restoration work. We work with architecture students and show them the development of architecture through the ages. “I doubt that this is really what we should be doing,” commented the chairman of the mathematics department. “The museum, as far as I know, is part of the graduate faculty. It should concentrate on training art historians in its PhD program, on its scholarly work, and on its research. I would strongly urge that the museum be considered an adjunct to graduate and especially to PhD education, confine itself to this work, and stay out of all attempts to be ‘popular,’ both on campus and outside of it. The glory of the museum is the scholarly catalogues produced by our faculty, and our PhD graduates who are sought after by art history faculties throughout the country. “These are very interesting and important comments,” said the dean, still trying to pacify. “But I think this can wait until we know who the new director is going to be. “I beg to differ, Mr. Dean,” said one of the elder statesmen of the faculty. “During the summer months, I discussed this question with an old friend and neighbor of mine in the country, the director of one of the nation’s great museums. He said to me: ‘You do not have a personality problem; you have a management problem. You have not, as a university, taken responsibility for the mission, the direction, and the objectives of your museum. Until you do this, no director can succeed. And this is your decision. In fact, you cannot hope to get a good person until you can tell him or her what your basic objectives are. 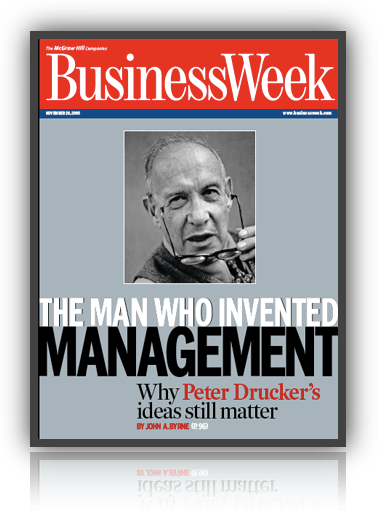 To Drucker, strategy, like everything else in management, is a thinking person’s game. It isn’t arrived at by following some rigid set of rules but by thinking through various aspects of the business. It all starts with objectives. “Only a clear definition of the mission makes possible clear and realistic business objectives. It is the foundation for priorities, strategies, plans and work assignments. It is the starting point for the design of managerial jobs, and, above all, for the design of managerial structures. Strategy determines what the key activities are in a given business. Drucker also explained that “nothing may seem simpler or more obvious than to answer what a company’s business is. A steel mill makes steel, a railroad runs to carry freight and passengers … . Actually ‘what is our business?’ is almost always a difficult question which can be answered only after hard thinking and studying. Thinking back to Drucker’s Law, no strategy can be created without the customer, for it is the customer who defines business purpose. And “therefore the question ‘what is our business?’ can be answered only by looking at the business from the outside, from the point of view of the customer and the market. What the customer sees, thinks, believes and wants at any given time must be accepted by management as an objective fact deserving to be taken as seriously” as any hard data collected from salespeople, accountants, or engineers, contended Drucker. And it isn’t only when a company is starting out that the question should be asked, or when the company is in trouble. “On the contrary,” Drucker wrote, “to raise the question and to study it thoroughly is most needed when a business is successful. If your late director is to blame—I know him and I know that he is abrasive—it is for being willing to take on a job when you, the university, had not faced up to the basic management decisions. At this point the dean realized that he had to adjourn the discussion unless he wanted the meeting to degenerate into a brawl. But he also realized that he had to identify the issues and possible decisions before the next faculty meeting a month later. What are the possible purposes of the University Museum? ⁃ to serve as a laboratory for the graduate art-history faculty and the doctoral students in the field? ⁃ to serve as major “enrichment” for the undergraduate who is not an art-history student but wants both a “liberal education” and a counterweight to the highly bookish diet fed to him in most of our courses? ⁃ to serve the metropolitan community—and especially its schools—outside the campus gates? Who are or should be its customers? ⁃ the graduate students in professional training to be teachers of art history? ⁃ the undergraduate community—or rather, the entire college community? ⁃ the metropolitan community and especially the teachers and youngsters in the public schools? Which of these purposes are compatible and could be served simultaneously? Which are mutually exclusive or at the very least are likely to get in each other’s way? What implications for the structure of the museum, the qualifications of its director, and its relationship to the university follow from each of the above purposes? Do we need to find out more about the needs and wants of our various potential customers to make an intelligent policy decision? How could we go about that? The dean distributed these questions to the members of the faculty with the request that they think them through and discuss them before the next meeting of the academic senate. How would you tackle these questions? And are they the right questions? Rarely has a chief executive of an American corporation been as respected and as revered as Alfred P. Sloan, Jr., was at General Motors during his long tenure at the top—from 1920 until 1955. Many GM managers, especially those who grew up in the 1920s and 1930s, felt a deep personal gratitude to him for his quiet but decisive acts of kindness, of help, of advice, or just of warm sympathy when they were in trouble. At the same time, however, Sloan kept aloof from the entire managerial group in GM. That he never called anyone by his or her first name and was “Mr. Sloan’ even to top executives may have been a reflection of his generation and upbringing—he had been born, after all, in the 1870s and was a senior executive, running his own business, before 1900. However, unlike most of his generation, he also addressed the African-American elevator men in the GM building in Detroit or New York in the same way. When he met a new elevator attendant, he would introduce himself, “I am Mr. Sloan. When the man answered, “I am Jack, sir,” Sloan would turn white with anger and would say, “I asked for your name, sir,” and would from then on always remember it. Sloan also frowned on the use of first names by his top people among themselves. It was known, for instance, that he felt it unwise of Mr. Wilson—for many years GM’s president and later Sloan’s successor as chief executive officer—that he was on first-name terms with most of GM’s vice presidents. Above all, Sloan had no friends within the GM group. He was a warm and had been a gregarious man until deafness cut him off from easy human contact. Although he had had close friends, he outlived them all—he lived well into his nineties. All these friends had been outside General Motors. Indeed, the one friend who had been in GM, Walter P. Chrysler, did not become a personal friend until after he had left GM and had, upon Sloan’s advice and with strong support from Sloan, started his own competing automobile company. As Sloan grew older, he keenly felt his increasing isolation as his close friends died one by one. Yet he remained aloof from GM people. He never invited them to his home. Unless it was a business meeting with a clear business agenda, he did not even sit down to a meal with any of them. He never accepted an invitation to any of their homes, even on business trips to their hometowns. He was once asked how he liked Winterthur, the estate of Henry Francis du Pont, a cousin of Pierre S. du Pont, who had been his boss at GM in 1919 and 1920 and chairman of the GM board for years thereafter. “I have never been to any of the du Pont homes,” he answered. In his earlier years, Sloan had been a keen outdoorsman—but his hiking, fishing, and camping companions had all been non-GM people. Only after his retirement in 1955, when advancing old age made it more and more difficult for him to travel, did he invite GM people to come to his home in New York—and then only to discuss business in the office wing of his apartment—for he was still a GM director and a member of the top committees. “It is the duty of the chief executive officer to be objective and impartial,” Sloan said, explaining his management style. “He must be absolutely tolerant and pay no attention to how a man does his work, let alone whether he likes a man or not. The only criteria must be performance and character. And that is incompatible with friendship and social relations. A chief executive officer, who has ‘friendships’ within the company, has ‘social relations’ with colleagues or discusses anything with them except the job, cannot remain impartial—or at least, which is equally damaging, he will not appear as such. And would such successful chief executives as Abraham Lincoln or Franklin D. Roosevelt have agreed? Would today’s successful executives agree?